A dog is one of the smartest pet you can own, it is known for its intellegence and loyalty to it's master, The dog is more commonly known as man's best friend. Sure once in a while your dog can give you headaches because of something it has done but usually a dog is a good companion and in some cases a good work animal. Dog's are also one of the most popular pets in the world because of their friendliness and companionship. The dog's intelligence depends on two factors, its training and it's genes. Some breeds are known to be much better behaved and much more intelligent than the rest, here you will find out about the 10 most intelligent breeds of dogs. The border collie tops the list of all dog breeds in its intelligence. It is a working dog breed and it is known for its strong work ethics and dedication to its job. The border collie is most satisfied when it is busy doing something. This breed has been used for herding purposes because of its great intellegence and is also used as a sporting dog. The border collie is known for its obedience, speed and agility. It is very easy to train and can learn new tricks quite well, its grasp on training is very strong. This breed loves human interaction an is happiest working alongside you. It is also good at sports and can be seen actively participating in flyball and disc game competitions. The poodle is known as a spoilt brat and people are very surprised that it is close to the top of the list for the most intelligent dog breeds. Don't judge a book by it's cover they say, keep that in mind. Do not let the looks of the poodle deceive you. This breed of dogs is absolutely amazing.The poodle is known to be used as hunting dogs as well as for watch and rescue. The poodle is also good with water and is sometimes used as a water dog. Poodles come in different sizes and even the smaller size poodles have their utility as hunting dogs used for bird hunting. The poodle is a very loyal and faithful breed they are very protective of their owners and love to be around humans. This cute little dog has the heart of a gladiator. The German Shepherd is one of the best known breeds in the world and is used by many countries by the armies and police, it is generally considered one of the smartest breeds of dogs. Although the German shepherd can look ferocious and dangerous it is the most lovable breeds of dog you will come across. These dogs adapt to training quite well and can do jobs that humans can not. German shepherds are generally police dogs and rescue dogs, and they are very good at their job. German Shepherds are very obedient, and protective of their owners and handlers. German Shepherds were used as herding dogs at one time but now they are utilized in jobs where they are much more useful. Often confused with the Labrador Retriever, Golden Retrievers are also very popular dogs that seem to be perfect for a family. In the past up to today, these dogs are man’s companion, especially for those who hunt. This breed can be easily trained to find and bring back waterfowl or game that has been shot. The dog’s soft mouth allows it to bring back unharmed game to its owner. Aside from being a hunting dog, Golden Retrievers can be used as rescue dogs, drug sniffing dogs, and guide dogs. This breed is very patient, which makes it that much easier to train. If you ever find a dog sports competition online or on the television, you are sure to see a Golden Retriever competing. This breed of dog comes in right at the middle of the list. The Doberman Pinscher is another German breed to make the list. In the past, these dogs were trained to be police dogs, watch dogs, and guard dogs. In the 1800s, men were looking for a dog that was loving and loyal as well as tough and ferocious when necessary. This is exactly where the Doberman Pinscher fits in. Even though they can be trained to be ferocious, many of these dogs are very gentle and docile. Some have even been used in hospitals to help patients that are undergoing therapy. Slightly vicious by nature, you can expect that this breed will protect you. Though not one of the most popular dogs around, the Shetland Sheepdog is a very smart dog. Some owners of this breed of dog claim that they are just as smart as a human is. Shelties originated out of Scotland. Sporting a furry two-layered coat and definitely not the toughest looking dog around, Shelties are used to herd sheep. Since the breed can be both big and small in size, some of these dogs are used to keep pests and smaller animals out of gardens. Shetland Sheepdog’s are generally very hyper, but they have a great sense of hearing. If anyone ever shows up at your door or a car pulls into the driveway, you can expect to hear a bark from this dog. This is one of the most intelligent as well as one of the most popular breeds of dog in the world. The Labrador Retriever is an amazing breed of dog that offer many different services. The breed originates from Newfoundland and was trained to hunt waterfowl. As time has passed, Labs have been introduced to more and more jobs. 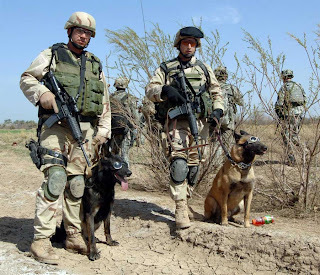 Many of these dogs are used in the police force as bomb sniffing or drug sniffing dogs. Any dog that can be trained to do this is most definitely smart. These dogs are also used as rescue dogs. Many are trained to help the disabled, especially the blind. Labs can be trained to lead a human around while ignoring any type of distraction. The Labrador Retriever is a loving, obedient, and patient dog that can be trained to do almost anything. This breed of dog is probably one of the cutest and smartest you’ll find. Papillons are able to show that cute things can be smart too. This breed also proves that small things (brains) do come in small packages. Papillons can weigh up to 11lbs and can weigh as little as 3lbs. These dogs are very charming and have always been a symbol of elegance. During the Renaissance, these dogs were adored by royal courts and the aristocrats of the time. They always proved to be good watch dogs because of their keen sense of hearing. Make the slightest sound and the Papillon’s ears will be up faster than you can say the name. King Henry II is said to have spend crowns upon crowns on his own Papillons. Better known as the “Rottie,” Rottweilers can be mis-trained to be vicious, mean dogs that can take down a human. Speaking of humans, Rottweilers can weigh as much as a petite sized female; about 110lbs in fact. This breed of dog originates out of Germany but was used in the Roman Empire. Rottweilers are sometimes used as police dogs because of the strong jaw and teeth that they have. Rotties can take you down! In the olden days, they were used to carry wood and other large heavy goods to markets and houses. If you’re looking to train a dog to protect you and all of your (precious) belongings, the Rottie is definitely the way to go. No you don’t have to live in Australia to encounter this dog. These dogs generally grow to be 30-50lbs. Australian Cattle Dog’s are known for their intelligence, especially when it comes to being able to train them to herd in cattle (this is where the name comes from if you didn’t catch it.) They have also been trained to be “biting” dogs. Don’t be scared, unless you’re training this dog to bite you. Australian Cattle Dogs are trained to bite cattle (not too hard) to keep them moving. These dogs have been herding cattle since the 19th century and today they still do just that. Australian Cattle Dogs are very active and love having a task at hand. It is advisable that when selecting a dog, you should know about the dog breeds and get a dog to suit your individual or family needs, some dogs are better at certain jobs than others and this should be kept in mind when selecting a dog breed to be kept as a pet. Also important is good training at the earliest possible age, this is when the dog learns fast and can be trained easily, a well trained dog will always be a better companion and work dog compared to a spoilt dog.